First, get your planter up to operating speed (i.e., the speed you are comfortable driving). Remember, fast works great for auto racing, but not when it comes to planting your crops. When you speed your way down the field, you give the planter less time to react to soil conditions, which usually results in uneven seed placement. Once you are up to operating speed, stop, get out of the tractor, and walk back at least 50 ft. With your shoes, walk directly over the top of a planted row with one foot in front of the other, until you have walked over at least 4 ft of row. Walking on top of the row will have the same effect as a 1.5 inch rainfall settling your soil. Keep in mind, soil on our Earthsoils® products and program will contain more air or oxygen. The fluffy tilth you observe when working your fields in the spring is an indicator that your soil is holding high levels of oxygen. Please recognize this important indicator. The first rain will settle the oxygen out of the soil surface and the soil will basically settle down more than what you would expect. Through this process of settling the seed will be shallower then what you intended it to be. Walking on top of the seed allows you to calculate a “settled” seed depth. Next, grab the old license plate or another thin, flat, sturdy object to measure the planting depth. Drag the license plate over the top of your row with the long side as your shovel to expose the seed. Also, use patience in this process as you uncover the seed gradually. Finally, measure from the top of the soil surface where you walked on the soil down to the seed. When it is 2.25 inches deep, you have achieved the optimal planting depth! 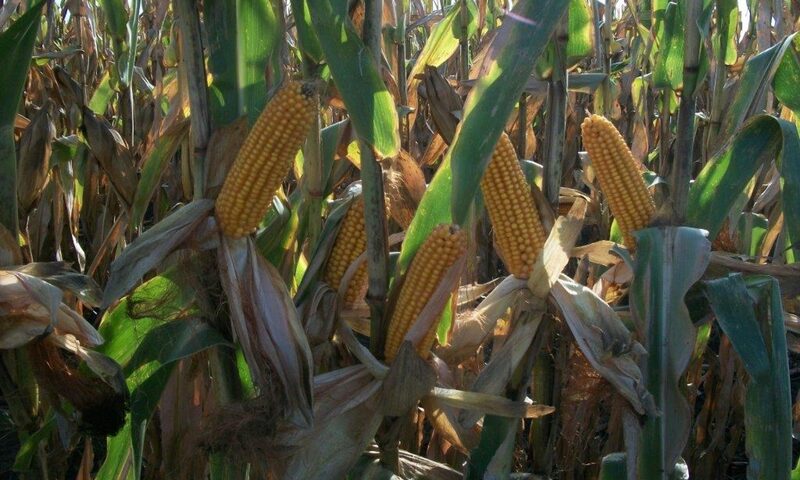 Planting depth has a direct correlation to the size of the stock and the ear that it will produce! If you have witnessed the big-stock, little-stock syndrome in your fields at pre-harvest and harvest time, take the time to dig up a stock. In particular, measure from the seed to the base of the point on the stock (see photo) and add ¾ of an inch to that measurement. The addition of ¾ inch will give you the relative depth the day at which you planted the corn. 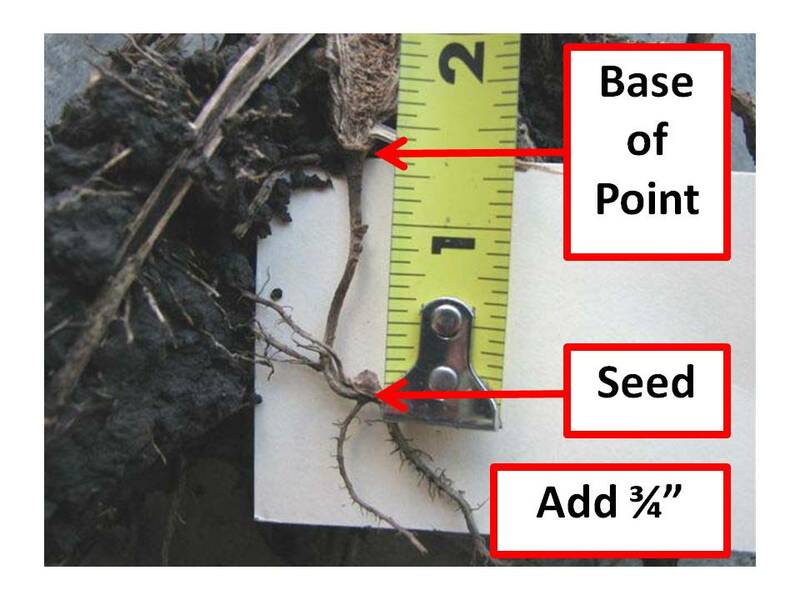 As little as ¼ inch difference can change your yield potential dramatically! By the way, the corn stalk in the picture was planted too shallow! Is it worth your time and energy to find your seed depth? Absolutely! You generate yield potential the second you place your seed in the ground. However, taking care in where you place that seed will decide how successful you will be at harvest. If you ever have questions regarding seed placement, contact us! We will gladly provide you with relevant resources to help you be successful! Next PostNext Seed Placement = Yield Potential!